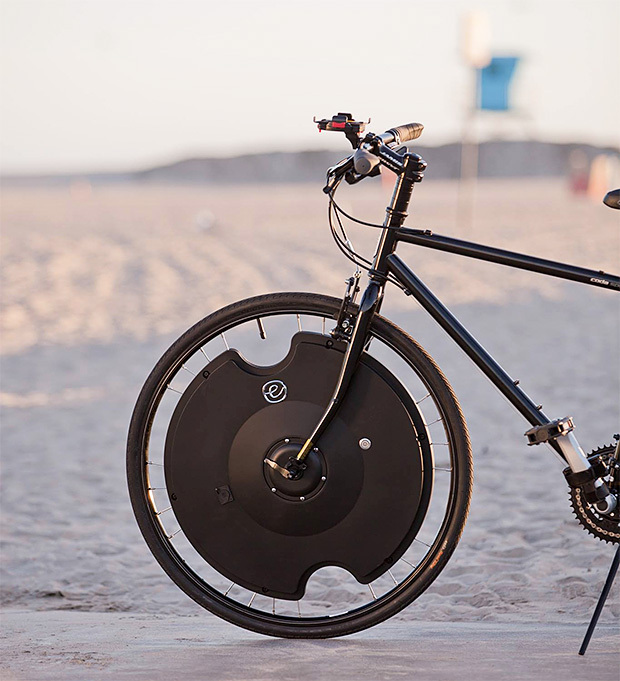 Convert Your Bicycle To Electric In 30 Seconds With The Electron Wheel | OhGizmo! By Jeremy Pearl on 11/07/16 • Leave a comment! You might’ve thought about getting an electric bicycle a couple times, but were discouraged by the high prices. Or maybe you wanted to convert your bike to electric assist, but were deterred by the complexity of the installation. Well, unlike other similar offerings, the Electron Wheel goes on the front wheel, making it possible to get setup in as little as 30 seconds. It’s a fully self-contained 250W propulsion system that can power your bike up to 20mph speeds, with a max range of 30 miles. After connecting to your smartphone, you can set it to kick in when the pedal sensor detects you’re putting in more effort (in a hill, for example), gradually assisting you so that you can climb with ease, only when you need it. There’s even a quick charging option that’ll get you up to your 30 mile range in as little as 2 hours. It’s $799, and the optional quick charger is an extra $85.